The Neurological Biomarkers Market for Alzheimer’s and Parkinson’s disease was valued at $3,958.5 million in 2017, and is expected to reach $8,579.9 million by 2025, registering a CAGR of 10.1% from 2018-2025. Neurodegenerative diseases such as Alzheimer’s and Parkinson’s are characterized by gradual loss of cognitive function, dementia, and problems with movements. Currently, research activities focused on biomarkers in the field of neurodegenerative diseases is significantly important, owing to surge in incidence of Alzheimer’s and Parkinson’s diseases worldwide. The key factors that boost the growth of the neurological biomarkers market for Alzheimer’s and Parkinson’s diseases include increase in focus on developing cost-effective biomarker testing and rise in demand for noninvasive diagnostic techniques for Alzheimer’s and Parkinson’s. In addition, surge in adoption of neurological biomarkers in clinical trials supplement the market growth. However, implementation of stringent government regulations towards the approval of commercial use of biomarkers and emerging ethical issues regarding early diagnosis of Alzheimer’s and Parkinson’s diseases are expected to hamper the market growth. Conversely, rise in demand for personalized medicine is anticipated to offer profitable opportunities for the expansion of the market. Neurodegenerative biomarkers for Alzheimer’s disease based on region is categorized into U.S., EU5, rest of Europe, China, Asia-Pacific, and rest of world (ROW). U.S. was the leading market in 2017, followed by Europe. The dominance of U.S. in the Alzheimer’s market is attributed to rise in patient population that suffers from this disease. For instance, Alzheimer’s disease (AD) affects five million Americans per year, and is the sixth leading cause of death in the U.S. However, Asia-Pacific is projected to emerge as a lucrative market in the future, due to the presence of large patient pool affected by Alzheimer's disease and surge in geriatric population. Moreover, increase in awareness towards Alzheimer's disease is projected to augment the growth of the market in ROW. Neurodegenerative biomarkers for Alzheimer’s disease based on region is categorized into U.S., EU5, rest of Europe, China, Asia-Pacific, and rest of world (ROW). U.S. was the leading market in 2017, and is expected to continue this trend throughout the forecast period. This is attributed to rise in expenditure on the management of Parkinson’s disease in the country. As of 2017, U.S. had a population of 326,506,644 individuals, and about 60,000 individuals are diagnosed with Parkinson’s diseases every year. Thus, significant prevalence of this disease among the U.S. population drives the growth of the market. However, China is projected to emerge as a lucrative market in future, due to the higher prevalence of Parkinson’s disease observed in males in 2017. 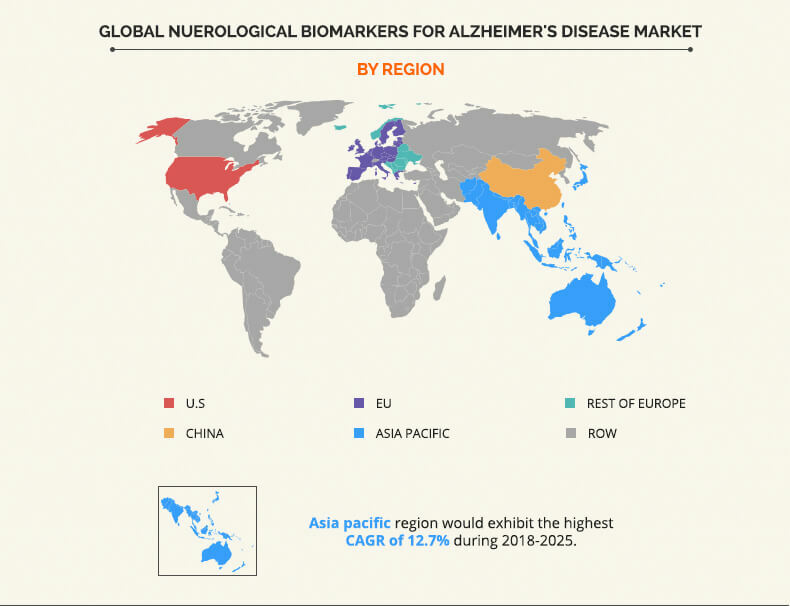 The report provides a comprehensive analysis of the key players operating in the neurological biomarkers market for Alzheimer’s and Parkinson’s disease such as Abbott Laboratories, Myriad RBM, Proteome Sciences, Thermo Fisher Scientific, Athena Diagnostics, Immunarray Pvt. Ltd., Quanterix Corporation, Diagenic ASA, Psynova Neurotech, and Bio-Rad Laboratories. The study provides an in-depth analysis with the current trends and future estimations of the neurological biomarkers market for Alzheimer’s and Parkinson’s diseases. Extensive analysis of key regions is provided to understand the neurological biomarkers market for Alzheimer’s and Parkinson’s diseases. TABLE 04. STATISTICS FOR ALZHEIMER'S IN U.S.
TABLE 10. STATISTICS FOR PARKINSON’S IN U.S. FIGURE 13. ALZHEIMER'S DISEASE BIOMARKERS MARKET IN U.S. FIGURE 20. 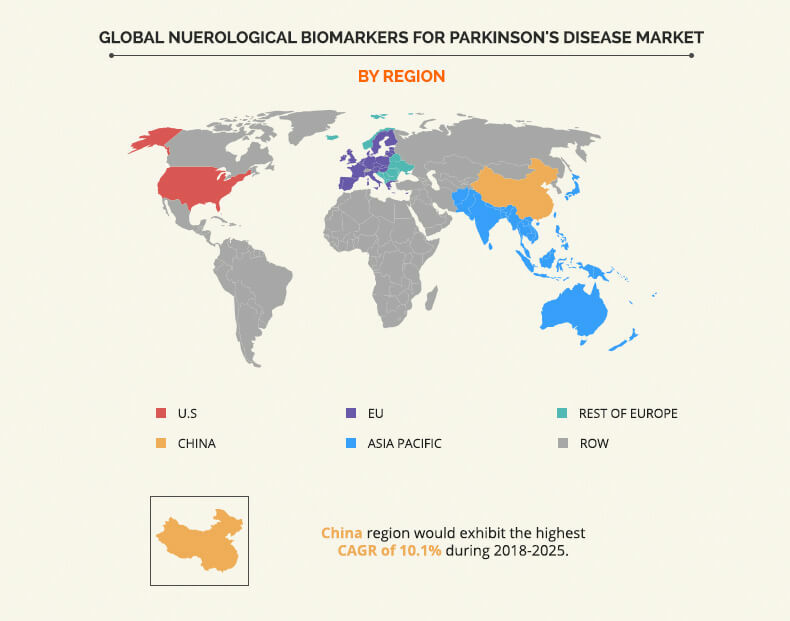 PARKINSON’S DISEASE BIOMARKERS MARKET IN U.S.
Biomarkers used for the patients suffering from neurodegenerative diseases enable the presymptomatic disease detection that further aids in offering valuable insights while monitoring the disease intensity in patients. The utilization of biomarkers is projected to witness a significant increase, owing to high demand for cost-effective and noninvasive diagnostic methods for detection of onset of the aforementioned diseases. Several market players are investing in the research activities pertaining to the development of neurological biomarkers. In addition, large population base aging 65 and above in the emerging economies is expected to fuel the demand for neurological biomarkers across the diagnosis as well as therapy of Alzheimer’s and Parkinson’s. Moreover, rise in government funding in the development of novel diagnostic and treatment solutions in the developed countries contributes to the significant application of neurological biomarkers across the aforementioned diseases. Furthermore, significant developments regarding personalized medicines for the patients with Alzheimer’s and Parkinson’s are anticipated to offer lucrative opportunities for the expansion of the market. Initiatives taken by key market players and local market players to develop cost-effective biomarker testing solutions for the patients suffering from Alzheimer’s and Parkinson’s disease is anticipated to drive the market growth in the near future. In addition, rise in preference for noninvasive neurological biomarker testing among the patients suffering from neurodegenerative disorders is expected to fuel the market growth.